It was a busy week and I was sidetracked working on a quilt for our camper, but I still managed a little progress :) I completed 4 new sections. I started using Thread Heaven and love it! It really helped me stitch faster with no knotting or kinking. So lucky to have the opportunity to link up with Jessica at Life Under Quilts! 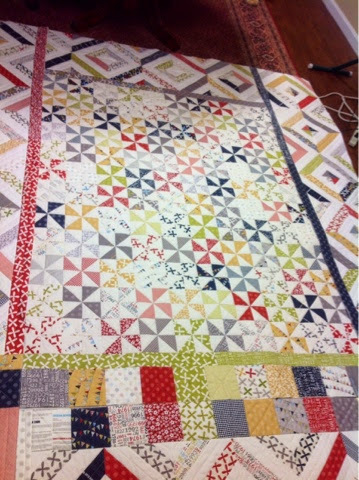 This is the quilt that has me sidetracked! The fabric is Reunion by Sweetwater for Moda. I just love this fabric and since our camper is near the ocean, it is the perfect colors! Hoping to finish this one this weekend. I pieced it and quilted it in sections and now it is ready to be sewn together and to tailor the corners to fit nice and snug! I really like the fabric for your hexies. Thank you! It is Marmalade by Bonnie & Camille. I fell in love with the line too! oh, I am a Sweetwater fan---what a gorgeous quilt for your camper!!! 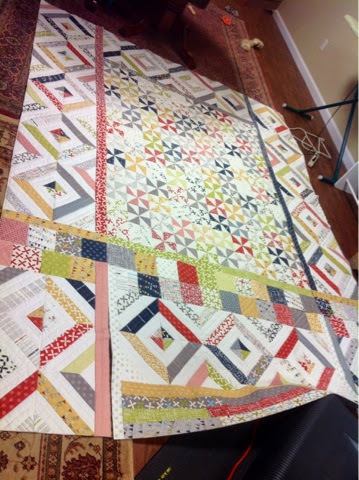 Can you tell me more about how you are sewing it together after quilting the pieces? I have been wanting to try that, but I have only looked at a few "methods" that just didn't look like something I would find success with...any suggestions/links/sites I should look into? Your hexies are looking good! I have a layer cake of Marmalade that I have yet to cut into.....I love what you are doing with that line!!! Thank you! I ended up serging the edges and opening the seams so the quilt would lay flat. I was going to bind the edges, but it ended up being to bulky and bumpy. If I were to do it again, I thing I would find a way to lay binding over the top of the seam. I love the Marmalade line too :) Something about it :) I would love to see what you do with your layer cake!